For the young and young at heart, what other time of year do you get to don your favourite costume, where it becomes socially acceptable to take on the personality of someone or something else! The great thing about Halloween is that it is for EVERYONE! From little pirates and princesses to adult size pirates and princesses, pumpkin carving and haunted houses, Fredericton has so many choices for all ghosts and goblins. We have a few things to get your fright on, both for young and old! How about trying this haunted house? Wednesday October 24th from 6:00-9:00pm is the kids only night featuring toned down imagery and kid friendly scares. Cost for this night is $3 for everybody attending. From 7-10pm the event will be enter at your own peril for high scare. Cost for Thursday, Friday and Saturday will be $10 for anyone age 12 and up, and $5 for kids under 12. Take a trip through our Laboratory of Terror featuring The Calithumpians Theatre Troupe! The St Mary’s Cultural Centre is once again bringing you their Haunted House! For a lower scare experience, bring the little ones for a fun “Candy Hunt & Low Scare Tour, Oct 27, 3-5pm; the monsters don’t act up until night time (J). From 7-11pm, Oct 26 & 27 is for more braver souls who dare to challenge the nightmare this year! The location is the amazing (and haunting) downstairs of the St Mary’s Cultural, right across from the St Mary’s Supermarket. For kids ages 3 and up, the APEGNB Haunted Tour (Low Scare) offers little ghosts and goblins spooky delights and fascinating sights with the all the intrigue of Science East’s location in the old York County Jail building at 668 Brunswick St. Children must be accompanied by an adult. You won’t know whether to laugh or scream (maybe both?)! Take a guided walk through Fredericton’s dark alleys, cemeteries and eerily empty parking lots. Bookings will be based on pre-formed groups. The group rate is a minimum of $360 based $13 per person. You can inquire as to dates at times by emailing Calithumpians@gmail.com or calling their headquarters at 457-1975. Bwahahahahaha…. Take a wagon ride through Mactaquac campground, a.k.a.”Booville” – that’s not scary, you say? Well, what was formerly a peaceful, quiet campground has been transformed into zombie walking, chainsaw wielding journey of terror… all you need to gain admittance is a non-perishable food item, oh and dress for the weather as all activities will be outdoors. Tons of activities, including: Best Costume Prizes, Pin the Nose on the Witch, Creepy Ghost Archery, Skeleton Search, Mummy Wrap, and everyone’s favorite, Put Your Hand in the Mystery Jar and much more! Just in case you haven’t had enough of zombies or unknown creatures chasing you through the shadows, this 5K run around Killarney Lake will have you watching out for lurking zombies hiding in the bushes. Runners wear ribbons and are “chased” by a zombie in a “capture the flag” style event. Zombies are stationed throughout the course in an attempt to get the runner’s ribbon. Winning the race means crossing the finish line with at least one ribbon. Good times! What a great way to trick or treat! 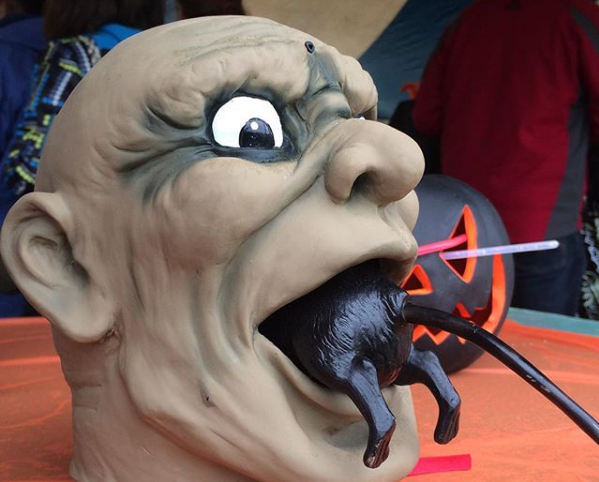 Visit the vendors at the Northside Market, show off your costume and have some trick or treating fun! This is a great alternative to traditional trick or treating for Halloween. Instead of kids going door-to-door to get candy, they dress up, or not, and go from trunk-to-trunk in our safe and fun parking lot. The massive drive-in cinema screen stands 60 feet wide, 40 feet tall and weighs in at over 1000 lbs. The family feature presentation is “Smallfoot” – rated G for all audiences, starting at 6:30pm. Concessions available. Take in a Triple bill – 3 movies for one great price! Halloween/Night School/Hell Fest; must be 18+ or 14+ accompanied by an adult. (Under 14 strictly prohibited). Gates open at 8:30 pm. A favourite Halloween event, where all goblins, ghosts and just plain weird creatures come out of the woodwork to rock with ‘80’s cover band “Pretty in Pink”. Tickets are $20 in advance at Tony’s Music Box, and $25 at the door. The Ville is throwing a Harvest Party! Come celebrate the end of the season with us with pumpkin smashing, pumpkin carving, a barbecue, fresh apple cider, hot chocolate, face painting, pumpkin bowling, bobbing for apples, and more great fall fun! Bring the whole family to join us in celebrating the season in our gardens! Admission by donation. Milda’s Pizza will be serving up some Halloween inspired pizzas, craft beer, live music, haunted brewery tours and a costume contest! Once again, kids will be able to trick or treat safely and out of the cold by visiting Brookside Mall. Bring your little goblins to the mall between 4-6 pm and participating retailers will have treats to hand out. Come and see the displays and characters on the Currie House Trails. Admission is by donation. This should keep many a green eyed monster busy this Halloween in Fredericton! So go ahead, dig out the costume and take part in the many events and activities taking place in the region. And remember kids, share the treats with the adults, cuz they love them too!